Join the discussion on our forums! 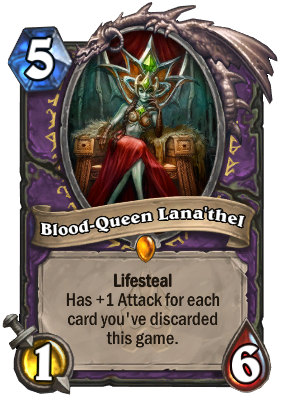 Come discuss Blood-Queen Lana'thel over in our dedicated Blood-Queen Lana'thel discussion topic. I hope she will finally see some play with the inclusion of Soulwarden, Shriek and Reckless Diretroll in the new expansion. The fact that you can somewhat control if you discard her, or potentially bring her back to your hand makes it hopefully playable. Honestly, if you play her in a Midrange Quest deck and your opponent has spent all his removals on your big midgame minions, she can be quite the game changer. "You have made an unwise decision" is quite fitting in that situation :D.
This card has one of the best Golden animations and sounds of the game. Too bad it's bad even in Discolock. I just got this card, and I admit it was disappointing. However, there will be four more expansions with this thing in rotation - so it will likely be good in the end. Discardlock looks like it gets some of its best support from Karazan cards, so the first expansion 2018 must be very good for this thing to see play. Only question is will it be good without the other Ungoro legends. 2 new expansions in and this card stil blows. That shouldn't change for the upcoming two this year. Only competitive deck that uses discards is Zoo that this card is too slow for. Only reason not to dust this is so it's not pulled again. is the discard-to-attack bonus in effect only when you have her in your hand, or even if she's in your deck - as in, does her effect only activate if I have her in my hand, or does she get the bonus even if she's in the graveyard/ the deck? It's a real disappointment getting this card from a pack. You open it hoping that it contains a deathknight. Than you see a legendary. It's glowing there. You slowly click your mouse. And there is lanathel. WOW legendarry. Please don't release this discard cards this much Blizz. And just don't make it a legendary. My first legenday is Lorewalker Cho my second is Millhouse Manastorm and the third it Nat Pagle. Her effect (aside of the life leech), as well as this of Rotface and Professor Putricide do totally not resemble their abilities in World of Warcraft. I am the only one who doesn't like their design? I had much better and more fitting ideas for them. I just got this card. Was sad that it wasn't a Death Knight Guldan instead...that said It's genuinely really a fun card in discard lock. Not top tier, but a fun card regardless. "You have made an unwise decision"
By putting you in my deck? The problem isn't Lana'Thel herself, the whole discard archetype is just bad. It's just a good card for a bad deck, or in other words: The unwise decision is not putting her in your deck, but choosing a deck which includes her.